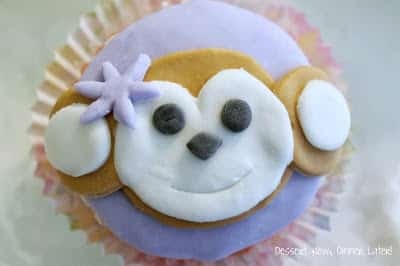 Girl Monkey Cupcakes Tutorial - Dessert Now, Dinner Later! I mentioned in my last cupcake tutorial that my kids’ birthdays are 3 days apart. I like to make nice cakes for their birthdays even if it causes me great stress. It gives me a chance to practice my skills. This year, I opted for cupcakes, which may or may not have been easier. Haha. Either way, they sure turned out cute & were great practice for me. 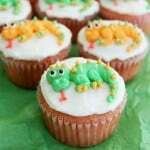 These ones are made with Marshmallow Fondant. 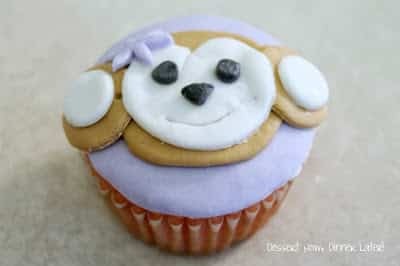 Girl Monkey Cupcakes Tutorial 24 cupcakes 1/2 cup buttercream 1 recipe marshmallow fondant Purple, brown, & black food coloring Set of small circle cutters (This is my set of 3) I also used the wilton piping tips for cut-outs (the brown ears & black eyes) or this is a really nice set. 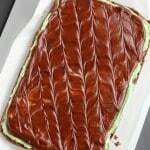 Make fondant, divide, & knead in the food coloring until no streaks appear. 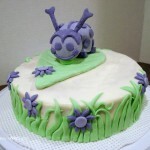 Roll out each color using powdered sugar to keep fondant from sticking to the surface. Frost a light layer of buttercream on top of the cupcake. 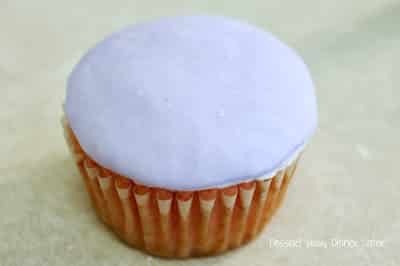 Cut out a large purple circle the size of the top of the cupcake. 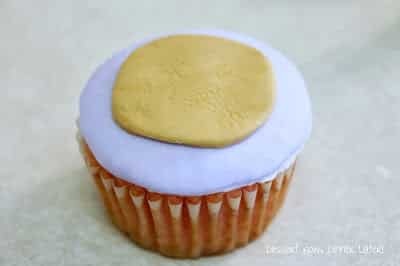 Immediately after frosting, apply circle to the top of the cupcake. Smooth over any bumps using your finger. Cut a medium brown circle. Use a dab of water on the back to adhere it to the purple layer. Smooth with your finger. Cut out two small brown circles for ears. Dab water on the back & set in place. 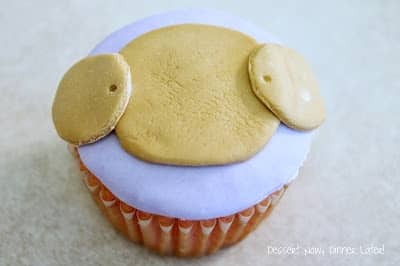 (I used one of my larger Wilton tips for this one & had to push it out, which is why it has dots on it.) Smooth with finger. Cut out two small white circles & one medium white circle. Using the small circle cutter, create a curvy “v” at the top of the medium white circle to shape the face. Dab each piece on the back with water to adhere to the brown layer. Smooth with finger. Cut out a purple flower. Cut out 3 tiny black circles. Use two black circles for the eyes & the third, shape into a triangle for the nose. Adhere each piece with a dab of water. Smooth with finger. Use a sharp paring knife to draw the mouth. Voila! Done! Repeat with remaining cupcakes. Work on a few cupcakes at a time. 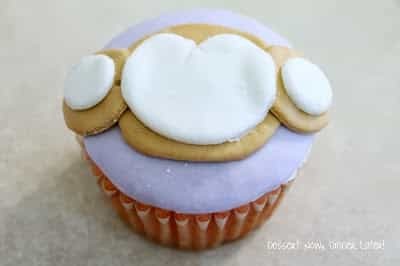 Dip cutters in powdered sugar to help keep the fondant from sticking when cutting out shapes. I also like to keep a tiny bowl of water & a paint brush (used only for food) to dab the back of my pieces with water when I adhere each layer. These cupcakes are so adorable! 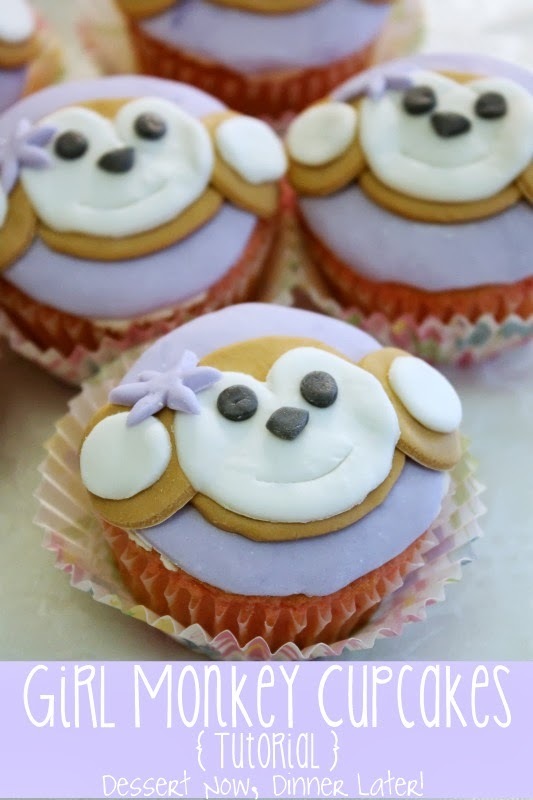 Love the little monkey faces! These are adorable!! Pinning! 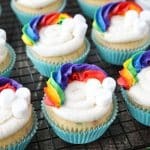 I can’t wait to make them for my little nieces.